I have the same problem every time I watch a Toshiro Mofune, but I just can't stand to watch it all the way through in one viewing. Perhaps my Hollywood ruined mind just cannot take a movie that has three lines of dialog and 20 minutes of horse riding in fog. Perhaps the act of reading subtitles on a black and white picture is too difficult for my pea brain. In almost all cases, it takes me a little while to digest what I have seen. 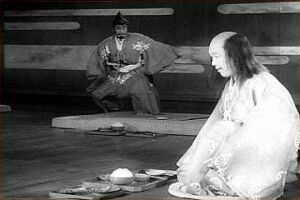 Throne of Blood is a good Kurosawa remake of Macbeth. Acting has changed a lot since the fifties. Mofune's lack of subtlety is a good example. He storms around, grimaces, throws himself into a corner, and howls with rage. It is hard to consider him a real character with the huge ranges of emotions his character has. There is one exception, a great scene where the two warlords who shared an encounter with an evil spirit in Spider Wood run into each other after the death of their great lord. The look they give each other is heartbreaking. A friendship lost to political power and blood. The story is a good representation of Macbeth. Some of it is downright creepy and the tie in's with typical Japanese clan wars is a lot of fun. The costumes are probably the best single piece of the film. Every detail, every rope, chain, plate, sword, arrow, flag, and boot is done with perfect detail. One could watch the whole movie with no subtitles just to see the costumes alone. The DVD of Throne of Blood is a Criterion remaster. The 4x3 picture is an accurate representation of the original aspect ratio of the film and cannot be faulted for not being 16x9 enhanced. The audio is mono. There is a commentary with a Kurosawa film historian included on the DVD. It is a good DVD for the Kurosawa or Criterion collector. There are a lot of Kurosawa movies. Each time I think I've exhausted the total collection, I find one more that I haven't seen. While Throne of Blood isn't as good as some of his other pictures, it is another example of a simple story wrapped with a lot of detail. If you've seen every other Kurosawa movie, give it a look. If you are new to Kurosawa, see Sanjiro in that order instead.